On the hill side of Mount Fravort, where the alpine mountain chain called Lagorai begins, a small chappel had been built in devotion of Saint Osvaldo. Here, on the edge of a hill overlooking the village of Roncegno Terme, a hermit lived the best part of his life taking care of the place. During the First World War on the same hill a long and bloody battle occurred between italians and austrians, for the predominance on a nearby strategic area.This chappel gives its name to the village Chorus of S. Osvaldo, established in 1968 by a group of friends. The first choral director and group soul was Doctor Primo Martinelli, followed years later by the teacher Carla Mosca, whose tenure lasted untill 2000. Since 2001 to 2009 the chorus has been directed by the teacher Federico Bonato. 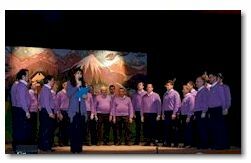 For 35 years our chorus has been offering a large range of folk and alpine singing, performing regulary on the stage of the Palace Hotel in Roncegno Terme. 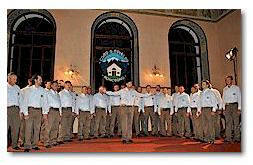 Since 1968 it has taken part in several choral festivals, visiting many places in north Italy. We have also travelled abroad visiting suche places as Stivor in Jugoslavia (1977), where many residents come from Trentino and Holland, Germany, Switzerland, Austria, Czech republic, North Wales (Llangollen Eisteddfod), Croatia, Bosnia, USA, Canada and recently, Hungary. In the repertoire, as well as classics of the alpine tradition, there are folk songs and pieces that reveal a deep historycal analysis of the musical culture in Trentino. Since 2010 the chorus is directed by the teacher Salvatore La Rosa and has 30 members.